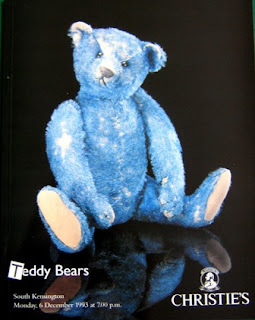 Here is the catalogue for Christie's first teddy bear sale held on Monday 6th December 1993. This was a very exciting event and was held in the evening starting at 7.00pm. Over 500 people attended and we had two rooms with two auctioneers. The star of the sale was Elliot, a very rare blue Steiff from 1908. According to Steiff, he was one of a sample made for Harrods, of six different coloured bears, which never went onto become an order. It is suggest that Alfonzo, the red Steiff sold at Christie's in 1989 to Ian Pout of Teddy Bears of Witney, was also part of this series. Nobody is certain what colours or size these bears are and as of yet, these two are the only ones ever to come up for auction. Elliot sold for an amazing £49,500 to a collector in Canada. Elliot was discovered by my good friend and Christie's head of dolls (later consultant) Olivia Bristol, from a chance discussion at an antique fair with a teddy bear collector. Olivia mentioned the upcoming sale and this collector thought it an ideal opportunity to introduce such a rarity to the market. The remainder of the sale was a very interesting selection of German, American and British teddy bears. Some of the highlights included a rather worn black Steiff Teddy Bear, a Schuco yes/no bellhop and two amazing Strunz cushion bears, which I remembered selling very cheaply at the time. There was also a section sold for charity of Colour Box Miniatures Bears, these ended the sale. Many of these were one-offs created just for the occasion. I'm going to detail the rest of the Christie's Teddy Bear catalogues over the coming weeks and months, these are a unique archive. If you wish to collect the set or complete the set you already have, they are all available to buy from my website www.danielagnew.com or from time to time I put the more common ones on eBay and very occasionally I include the rarer ones. All prices realised can still be printed off Christies.com or you can phone the bids and results office number in the front of the catalogue and they will send you the results.